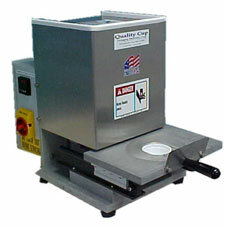 The Table-Top Pre-Cut Lid Sealer is a cost-effective and versatile machine for sealing containers with pre-cut foil or non-metallic lids, which offers a good solution for low volume production requiring a tamper-evident heat-sealed container. Operation of unit is simple: The operator places a cup into the cup receptacle, manually places a lid on the cup, then advances the cup/slide assembly into the heat sealing position. A proximity switch activates the pneumatic heat sealer. 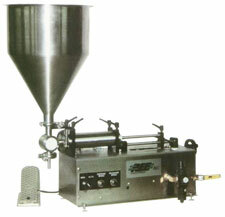 After heat sealing, the operator retracts the cup/slide assembly and removes the sealed cup. It can produce at rates of 8-15 containers per minute depending on the product and operator skill. 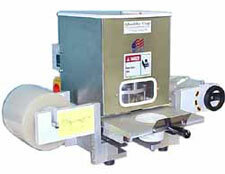 The Table-Top Rollstock Film Cup Sealer is a cost-effective and versatile machine for sealing containers, and offers a good solution for low-volume production requiring a tamper-evident, heat-sealer container. Operation of unit is simple: The operator places a cup into the cup receptacle, then advances the cup/slide assembly into the heat sealing position. A proximity switch then activates the pneumatic heat sealer. After heat sealing, the operator turns the handle to advance the film, retracts the cup/slide assembly to the starting position, and removes the sealed cup. A new cup is inserted and the process is repeated for additional cups. The SVS-J Table-Top Filler is a cost-effective and versatile machine designed to be manually operated as a stand-alone filler of integrated into a fully automatic machine.